One of the secrets that makes this easy, soft gingerbread cookie recipe so tender is rolling the dough thick, between 1/4 inch and 1/2 inch. The other is not to overbake them. Overbaking will cause them to become too crisp. It's also important to store the cookies properly. Add a piece of white bread to the cookie tin to keep your gingerbread cookies soft and fresh for up to one week. For a more nutritious, fiber-rich version of these cookies, use white whole-wheat flour. White whole-wheat flour has the same nutritional profile as regular whole-wheat flour, but it bakes up a bit more like all-purpose flour and yields a more tender cookie. 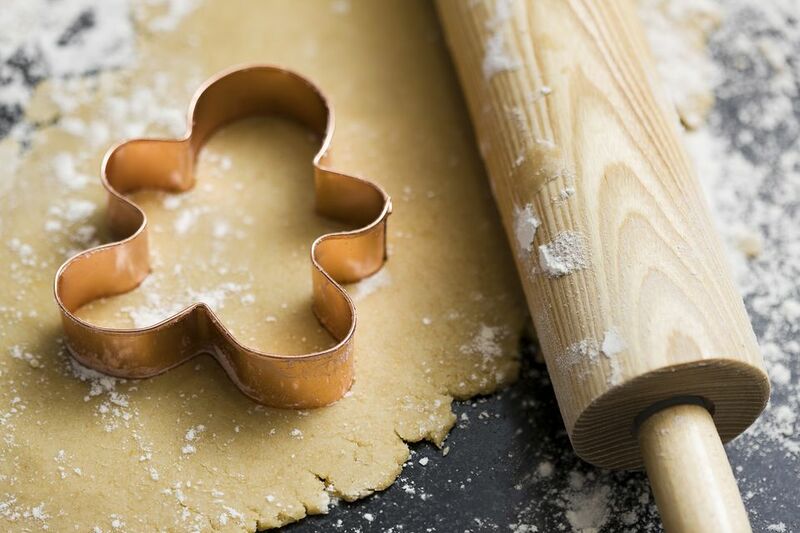 One way to make lasting memories with the kids is by baking easy cookie recipes together. Melt butter in a large saucepan over low heat. Stir in the brown sugar and molasses until the sugar is dissolved and the mixture is well combined. Remove from heat. Let the mixture cool 5 minutes, then transfer to a large mixing bowl. Beat in the egg. In a separate large bowl, whisk together the flour, baking powder, baking soda, and pumpkin pie spice. Mix the dry ingredients into the wet ingredients with a wooden spoon or sturdy spatula (not an electric mixer) until you can't see any flour anymore. The dry ingredients should be well incorporated but do not overmix or the gingerbread cookies will be tough. Divide the gingerbread cookie dough in half. Form each half into a disk. Wrap in plastic wrap. Refrigerate at least 1 hour or up to four days. When ready to bake, remove one disk of gingerbread cookie dough at a time from the refrigerator and let it come to room temperature. Heat the oven to 350 F. Line cookie sheets with Silpat mats or parchment paper. Place a little flour on the Silpat mats or parchment paper (alternatively, flour a board generously). Unwrap the dough, and place the plastic wrap on top of the dough as a buffer to keep the rolling pin from sticking to the dough. Roll the gingerbread cookie dough to a thickness of 1/4 to 1/2 inch. Cut into desired shapes. Arrange the gingerbread cookies on the baking sheets, so that they are 1 inch apart. Repeat with remaining disk of dough. Bake the gingerbread cookies 7 to 4 minutes or until just firm to the touch. The cooking time will depend on how thick you rolled the cookies. Remove the cookies from the oven, wait 2 minutes, and, using a flat spatula, transfer them to a wire rack to cool completely. Decorate with royal icing, colored sugars, sprinkles, or candy canes. Store for up to one week in a covered container with an optional slice of white bread to retain the moisture in the cookies.